Early departure from the Riad, towards the Palmeraie of Marrakech. We will pass by the base camp, before we take a 4x4 to go to the place of take off. Only one hour away from the main square of Jemaa El Fnaa, you will discover the magic of a unique and extraordinary moment. 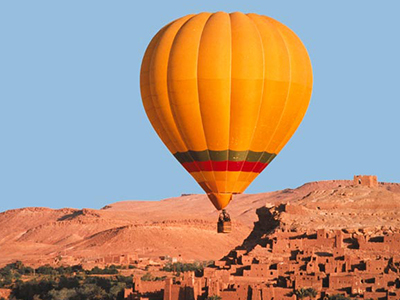 The hot-air balloon will become a machine to go back in time, and this incredible sensation to glide in the air, will allow you to discover the fabulous contrast which exists between the city and the countryside which surrounds it. 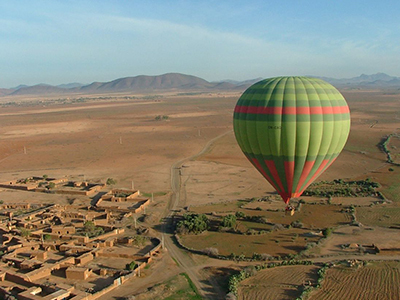 Some kilometers and 2000 years separates us from Marrakech! The flight will last one hour, and depends naturally on weather conditions. After this fabulous travel, we shall land somewhere in the nature, before the 4x4 will come to pick you up, and take you to a traditonal local home to drink tea. You will leave then, by tracks, before returnig the Riad. Arrival at around midday.